Wow, such wonderful colours and embellishments on your card!!! I just adore the soft flowers and the wine branches!! A fabulos piece of Art!!! 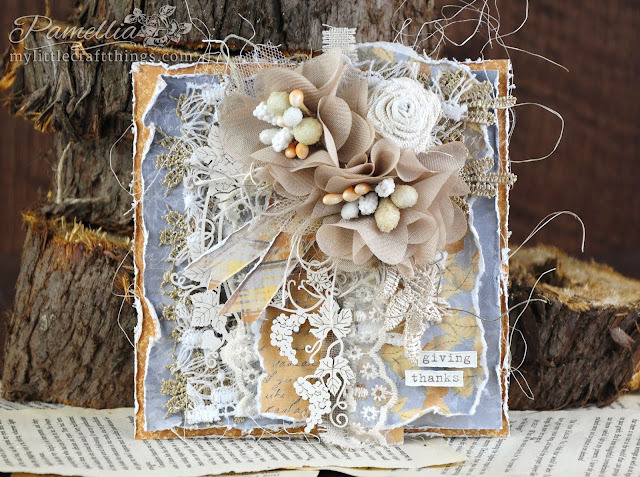 Stunning card Pamellia, all the layers are fabulous. I love the the flowers and lace and really all the embellishments you've used, i's a work of art. A truly stunning card Pamellia, I love those Scrapiniec pieces you used. Stunning card Pamellia!! 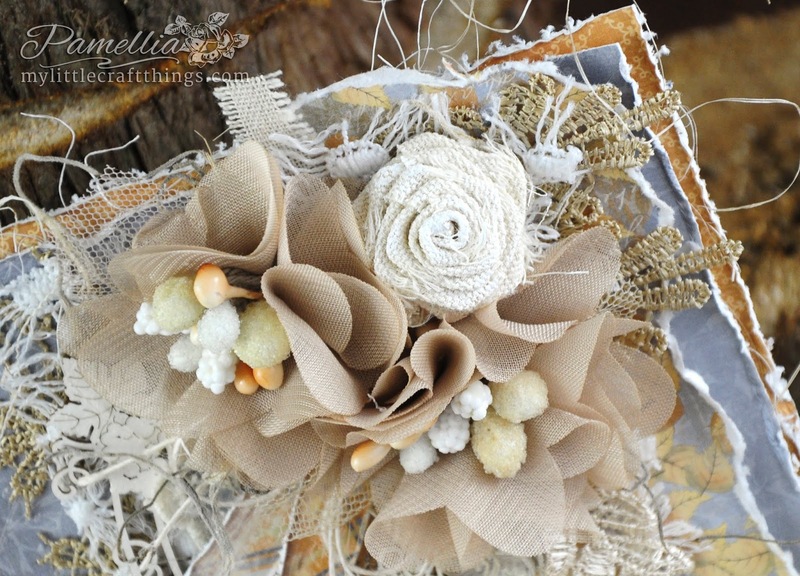 The colour mix is beautiful and I love the papers used. 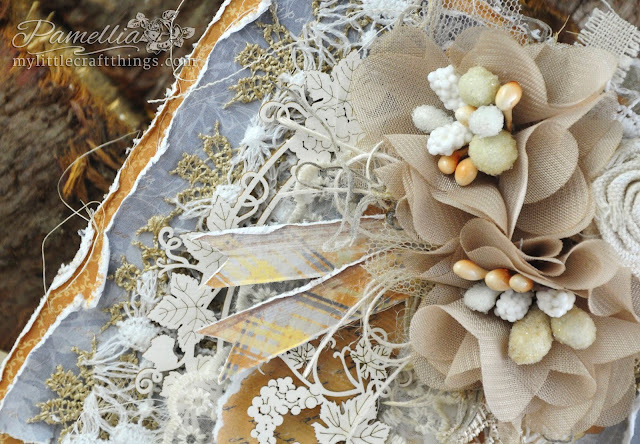 The lace and chippies are gorgeous too but I really love the flower cluster .. absolutely divine! 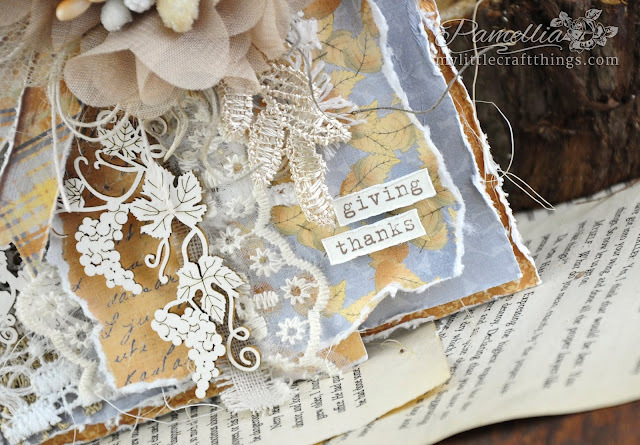 Another amazing card Pamellia, I love how you use those beautiful embellishments. Thanks Patty. I sort of made them. They started as little chiffon pom pom type things. I flattened it out, cut a hole in the middle, put a stamen sprig through the centre and glued it down. Another stunning card Pamellia! I mean Wow. Love the fur babies. Glad they’re doing well. Oh, wow! I love these colors on your card! 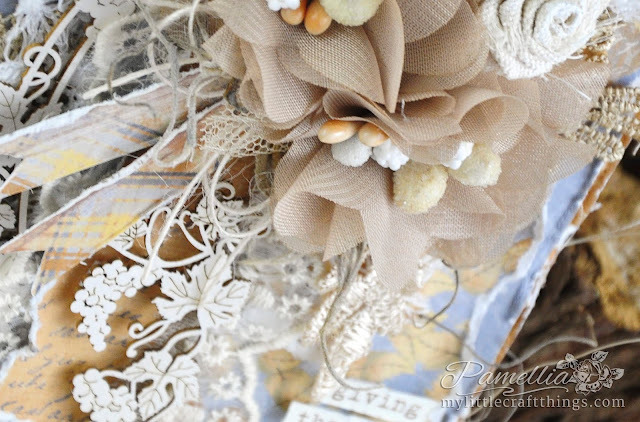 And the chippies are so delicate and this is just an amazing Thanksgiving Day card! And those little fur babies are just adorable! These little guys are so blessed to have you help them along. Sending hugs! An incredible dimensional masterpiece Pamellia!! Love it. Love your wee video of Scarett, but I am not so keen on the Opossum one - they are a noxious pest here!! Our climate is more conducive to rapid breeding of them, and they threaten the very existence of our native forests as they de-bark the trees. Cette carte est magnifique dans les tons comme dans les détails. Je suis toujours fan de tes idées créatives... Quel talent ! J'ai vu les vidéos sur facebook, mais je souhaite que Scarlett se rétablisse vite. Calins à tes Loulous et bises. This card is beautiful in shades and in details. I'm always a fan of your creative ideas ... What a talent! I saw the videos on facebook, but I wish that Scarlett recover quickly. Calins to your Loulous and kisses. 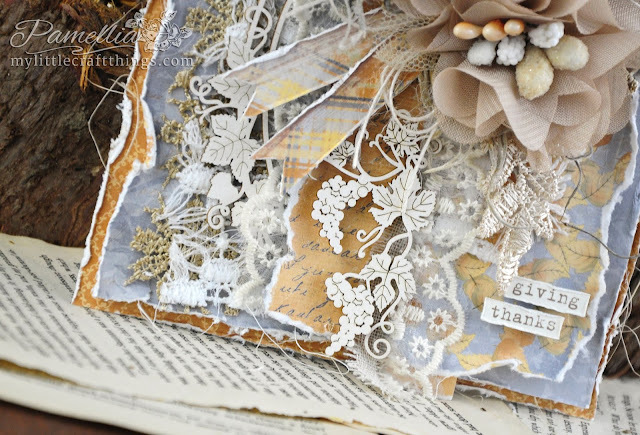 Outstanding card Pamellia, gorgeous colours and wonderful layout and I just love all of those wonderful embellishments. Your opposume is very sweet but he has some very sharp teeth by the looks of things, watch your fingers!